In a writing career that began in 1874 and continued until her death in 1922, Murfree published dozens of short stories and novels depicting life in the American South. In 1878 The Atlantic Monthly published her first short story set in Southern Appalachia “The Dancin’ Party at Harrison Creek.” She continued to write and publish under her pen name throughout her career even after finally revealing her true name in 1885 to Thomas Bailey Aldrich, editor of The Atlantic Monthly. Murfree wrote in a genre known as American literary regionalism, or local color, and was one of its early architects. This style of writing emphasized the dialects, customs, and history of a particular region. Where Missouri had Mark Twain, and Georgia had Joel Chandler Harris, East Tennessee had Murfree. Though the style fell out of favor early in the 20th century, it was extremely popular in its day and Murfree was considered one of its best exemplars. The publication of The Prophet of the Great Smoky Mountains and In the Tennessee Mountains, both in 1885 were the first works of fiction to bring Tennessee and the Great Smoky Mountains to the attention of the public. According to a review of her works published in The Commercial Appeal in 1914: “she has made friends with the Tennessee mountains. She has taken them into her confidence, and they have yielded her the secret of their allurement.” Murfree would face criticism later, as would most local color authors, from critics who characterized this genre as unflattering. With passages like “Waal, said Amos at last, rising, ‘I’d better be a-goin’. ‘Pears like ez I hev wore out my welcome hyar” it isn’t hard to understand the detractors of this literary style. In 1936 Murfree’s sister Fanny donated a small collection of items from her sisters writing career to the park museum committee. The collection consisted of correspondence, news clippings, a scrap book, and published volumes of her work and are now housed at the Collections Preservation Center in Townsend. A slightly more comprehensive collection is available at Emory University. In reading through some of the correspondence, it appears she had quite a following. 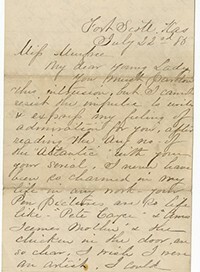 In 1885 the president of a Fort Scott, Kansas book club wrote to Murfree gushing about how much her group loved reading The Prophet of the Great Smoky Mountains, “I never had been so charmed in my life in any work – your pen pictures are so life like.” Someone from Petrufquen, Chile wrote the post master of Murfreesboro in 1921 asking after Murfree saying “I have always tried to keep note of her doings, as she was such a charming writer…” Murfree was so well thought of that there was even a small movement to name a peak in the newly formed national park after her penname, Craddock. Mike Aday is the librarian-archivist at the Collections Preservation Center, where artifacts from Great Smoky Mountains National Park are housed. The Collections Preservation Center existence was partly made possible through funding from Great Smoky Mountains Association. Email Mike HERE or call M-F, 9 a.m. to 3 p.m. at 865-448-2247.